Once upon a time I only had the Lugoff & Camden RR. I lived in Lugoff South Carolina and Camden is just across the Wateree River from me. 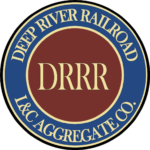 The Railroad Logo is a simple roundell that resembles many other railroad logos from the turn of the century. In time I realized I wasn’t happy with a narrow gauge line here and developed a subsidiary line, the Deep River Railroad in North Carolina (On30). I based this on the Deep River Coal Mine area in North Carolina figuring I could use a narrow gauge to harvest various aggregates in the area. I then connected the L&CRR to the DRRR. 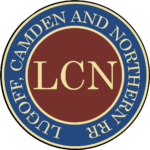 The logo is a rondell that closely follows that of the parent LCN. In fact I then created the L&C Aggregate Co. 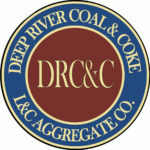 I created a third railroad, the Deep River Coal & Coke. This is an On18 line that carries coal to the coking ovens originally. The ovens took up so much room that I removed them and replaced with a tipple.